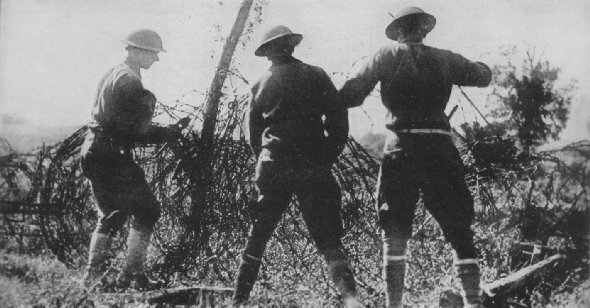 Soldiers of Comapny A, 103rd Engineers, 28th Division, removing wire from road after the frightful artillery fire that caught whole regiments of men. This photograph was taken at Boureuilles, Department of Meuse. 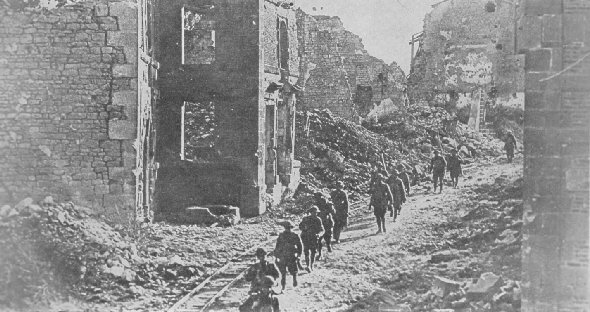 Company K, 110th Inf., 28th Div., passing through ruined city of Varennes. Over 2,500,000 French refugees left their homes before the German flood. Their homes are no more. 3,000,000, unable to escape, remained behind the lines.